I based my raspberry and white chocolate flapjacks on a recipe for blueberry and white chocolate flapjacks that I haven’t yet posted. I extricated some condensed milk which had been lurking in the back of the fridge since I made Baileys ice-cream and set to. The result were these fast and fruity flapjacks. They were both sweet and tart, crisp on the outside and nice and chewy on the inside – very tasty. If only all baking were this simple. I grew up on flapjacks and have many recipes for these fabulous oaty bakes. Have a look, you’re bound to find something you like the sound of. They are super fast to make. 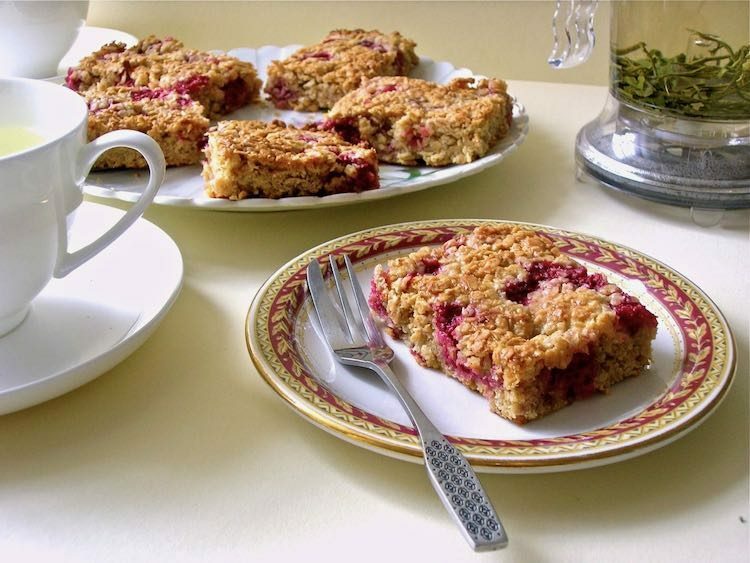 These raspberry and white chocolate flapjacks can be ready in half an hour. They’re particularly good for picnics, lunch boxes or eating on the go. They also make a delicious pudding when served warm with custard or cream. If you use gluten-free oats, they are also perfect for celiacs and those who have a gluten intolerance. Fruity flapjacks that are both sweet and tart. Super fast to make, these can be ready in half an hour. Great for picnics and lunch boxes, they also make a delicious pudding served warm with custard or cream. Melt the butter, condensed milk and white chocolate in a large pan over low heat. Stir in the oats and raspberries as carefully as you can until just combined. Press into an 8" or 9" sq silicone mould (or lined tin). Bake for 20 minutes at 180°C. Leave to cool then cut into 12 rectangles. 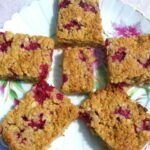 Spotting the bargain price raspberries for 49p makes these simple but very tasty flapjacks prime targets for Credit Crunch Munch which is being hosted over at Jen’s Food this month. Challenge created by Helen of Fuss Free Flavours and Camilla of Fab Food 4 All. Using up said raspberries and the condensed milk also means these flapjacks can be sent to the No Waste Food Challenge over at Elizabeth’s Kitchen Diary. Let’s Get Fruity is the theme for this month’s Treat Petite with Baking Explorer and CakeyBoi. Thanks for visiting Tin and Thyme. 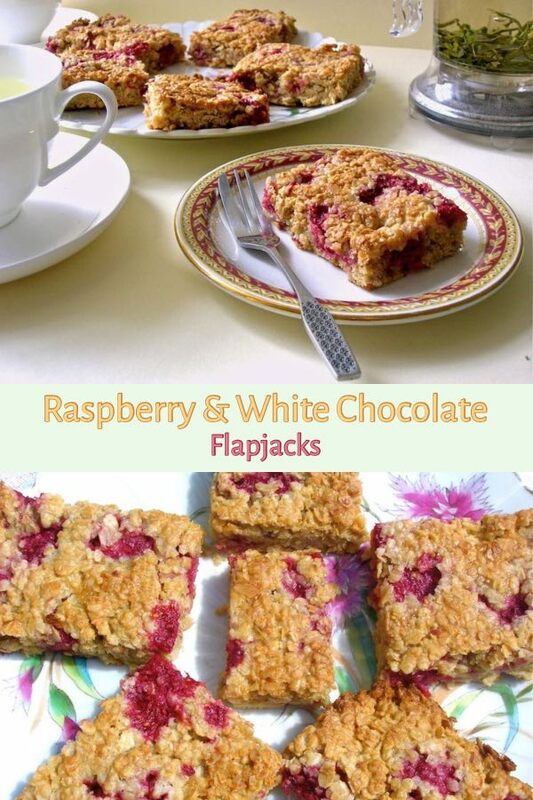 If you make these scrumptious raspberry and white chocolate flapjacks, I’d love to hear about it in the comments below or via social media. Do share photos on social media too and use the hashtag #tinandthyme, so I can spot them. For more delicious and nutritious recipes, follow me on Twitter, Facebook, Instagram or Pinterest. Raspberry and White Chocolate Flapjacks. PIN IT. These look delicious and I love all your photos, thanks for adding my flapjack post. Never baked flapjacks before. They are not very well known in The Netherlands. I saw the list of other recipes and straight away put the oven on. For further reading: see my comment below the recipe for ‘jammy flapjacks’. Ah yes Henk, flapjacks are a much loved British store cupboard classic. The standard recipe is butter, sugar, syrup and oats and what ever dried fruit and nut additions you care to add. It’s a great recipe to adapt too, using honey instead of syrup for example, or condensed milk as I have here. Yummy! They look very delicious. Sometimes there has to be some simple baking, too, and sometimes also the other baking. True Chris, I’m all for simple baking, but sometimes it’s good to push the boat out. The reduced price fruit can look so tempting in the shops but I’m usually too pushed for time to use it in any elaborate recipe. This sounds like a very fine idea. I must remember this. Thanks Phil, being pushed for time is definitely overrated. Bring back those teenage years where we used to go on about being bored I say. I love the look of these, I bet they tasted amazing. Sometimes simple recipes are the best. Thanks Jo. Yes simple is good and often more achievable for time pressed home cooks. I love your flapjacks Choclette.. raspberries and white chocolate mmm. Great combo! Thanks Hannah, that’s the beauty of flapjacks – easy, fast and delicious. Thanks Stephanie, you are so right. Thanks for stopping by. Ooh yes, apricot flapjacks would be gorgeous Emma. Mmmmm…. I love fruity flapjacks, especially chewy ones. These sound delicious and I love the pink colour peaking through! Flapjacks are so good for using up fruit. If you haven’t done it before, try roasting the fruit before it goes into the flapjack mix….. Divine! Ooh nice idea Kate. Co-incedntally, I roasted a load of strawberries yesterday but never though of putting them in flapjacks. I am not normally a fan of fruits in flapjacks but I really do want a bite of these. If these don’t win you over Bintu, I’m not sure what will. Mmm can’t go wrong with raspberries and white chocolate, gorgeous. It’s a great combination and why I’d never thought to try it out in flapjack form before now beats me. These so look so delicious and perfectly presented! Love the use of raspberries. Thanks for entering into Treat Petite. Thanks Kat, the flapjacks are a great way to use up not quite perfect raspberries. Ooh, I hope you are not disappointed Henk. The jumbo oats are pretty much what they say – just larger oats which I added for extra texture, but ordinary oats would have been fine. I expect the addition of ground almonds will make them even more delicious, but I will be interested to find out if they still hold together properly. They are indeed rather crumbly because of the almonds, but the taste is good. I have to say that I have never been a fan of the taste of condensed milk, but I found a can in the cupboard and was curious enough to try this recipe. It is definitely to be recommended and the combination with raspberries and white chocolate is a good one. So, still 200 ml of condensed milk left to finish. Would it be a good idea to mix it into a brownie of some sort ? Thanks Jen. It gives them a bit of a fudgy consistency which I like. These do sound rather heavenly! A great way to use up reduced price raspberries and some condensed milk. I could seriously go one of these for breakfast right now – oats are good breakfast food, no? 🙂 Thank you for sharing with the No Waste Food Challenge! Haha Elizabeth, we can always try kidding ourselves. A seriously tasty treat though, that isn’t nearly as ‘bad’ as many. Alternate to condensed milk would be appreciated . Giving these a go now. Hi Nikki. Without trialing out another recipe, I wouldn’t like to give a substitution on this as the condensed milk brings very particular qualities. These look great and so easy to make too. I also love flapjacks but have never tried making it. Thanks for sharing Raspberry and White Chocolate Flapjacks.